It is with heavy hearts that Greg Parker and all the staff at Ballarat Wildlife Park are mourning the loss of Patrick the Wombat, who passed away on the 18th April. Patrick came to the Park as an orphan after his Mum was hit by a car in 1987 and was raised by Greg Parker and his family. At over 31 years of age he was the oldest known Bare-nosed Wombat in captivity and exceeded his normal life expectancy by more than a decade. He is most famously known for greeting visitors in his blue wheelbarrow, his gentle nature, and his “bucky-toothed” smile. When Patrick celebrated his 31st Birthday on Sunday 28 August 2016, he was surrounded by hundreds of fans and had Birthday wishes sent from all around the world. With over 55,000 Facebook fans, Patrick touched the hearts of many people. Dr. Adrienne Lavinia, the Park’s resident Veterinarian, said “for Patrick’s age he has been in amazingly good health for the past few years, and only recently have we initiated geriatric care of a similar nature to dogs and cats. Due to a sudden decline in health, the difficult decision was made to put him to sleep whilst surrounded by all his carers.” Greg, Julia, Stuart and Charlie would like to thank all those who have supported Patrick and the Park and we would also like to thank all the Keepers who have lovingly cared for Patrick over the years. 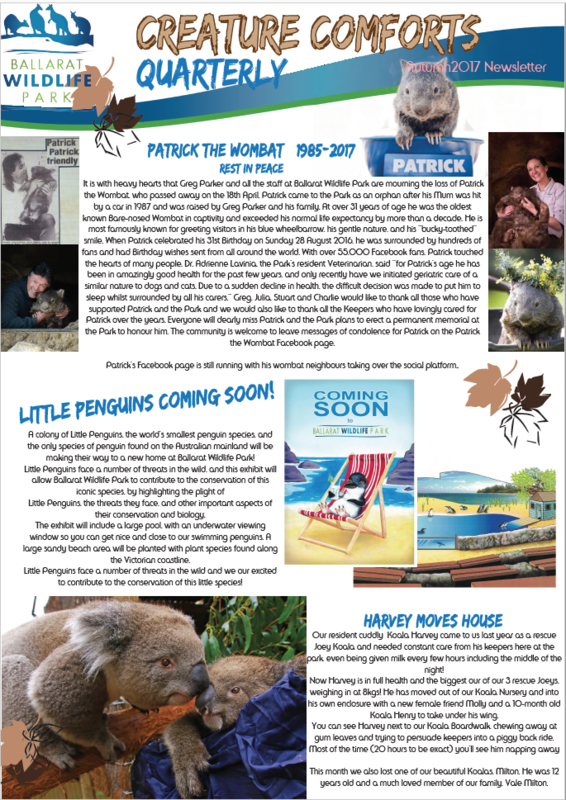 Everyone will dearly miss Patrick and the Park plans to erect a permanent memorial at the Park to honour him. The community is welcome to leave messages of condolence for Patrick on the Patrick the Wombat Facebook page. Patrick’s Facebook page is still running with his wombat neighbours taking over the social platform.